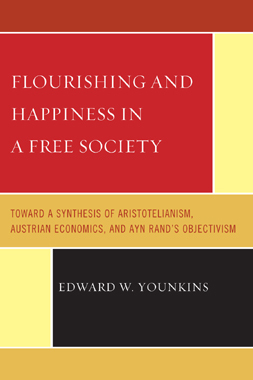 Edward W. Younkins's Flourishing and Happiness in a Free Society: Toward a Synthesis of Aristotelianism, Austrian Economics, and Ayn Rand's Objectivism provides a framework for a potential paradigm of human flourishing and happiness in a free society. It is an exploratory attempt to construct an understanding from various disciplines and to integrate them into a clear, consistent, coherent, and systematic whole. Holding that there are essential interconnections among objective ideas, the book emphasizes the compatibility of Aristotelianism, Austrian economics, and Ayn Rand's Objectivism. It argues that particular ideas from these areas can be integrated into a paradigm of human flourishing and happiness based on the nature of man and the world. Such a paradigm will help people to understand the world and to survive and flourish in it. The book's preface is reproduced here with the kind permission of the author. A review of the book by Gennady Stolyarov II was published earlier this year in QL (no 286 – February 15, 2011). This book has been a long time in the making. My interest in the inextricable interrelationships among freedom, morality, human flourishing, and happiness was first animated around twenty years ago when, at about the same time, I was reading the works of Ayn Rand, Leonard Peikoff, Tibor R. Machan, Douglas B. Rasmussen, and Douglas J. Den Uyl. I was strongly attracted to the idea of human flourishing and happiness as the prime goal of human striving. This prompted me to read widely and deeply in the area of political and economic philosophy. I read and studied writings from various periods including the Ancient, Medieval, Early Modern, Renaissance, Late Modern, and Contemporary eras. My study of intellectual history led me to identify my prime intellectual influences: Aristotle, Ayn Rand, and certain Austrian economists. I found them to be exemplars for a potential paradigm of Aristotelian classical liberalism and human flourishing. Aristotle (384-322 B.C.) taught that to make life fully human (i.e., to flourish) an individual must acquire virtues and make use of his reason as fully as he is capable. His realistic theory of knowledge included the need for specific individual interpretation with respect to a person’s actions because of the multitude of various human circumstances and capabilities. Rather than insisting on ascetic living, Aristotle states that human beings are to develop their powers and to live well and comfortably—men exist for the sake of the good life. He said that each citizen should aim at a good life—the life of the polis. Aristotle was devoted to the polis which has the goal of promoting the good and the virtuous. Aristotle is somewhat inconsistent across his various writings when he discusses the proper functions of the state and of the community and uses the term, polis, to refer to each of these at various times. He has written that happiness can be attained only in a well-functioning political community. He speaks of well-being as the chief end of the state and sometimes cites the need to have the state force men to be virtuous via laws and punishments. Aristotle says that the polis is required in order for individuals to attain their natural ends of life and happiness. He teaches that the state should establish the rule of law because justice is necessary for human beings to be able to fulfill their natures. Aristotle has also written in places that a well-ordered stable state offers individuals the greatest opportunities for achieving happiness but that it does not take steps to make them happy. Aristotle has provided us with many economic concepts. For him, as for other Greek thinkers, the economic element is subordinated to the political and to the ethical—his economics is embedded in his politics and grew out of his political and moral philosophy and was presented in the context of philosophy. Aristotle denied the labor theory of value, hinted at the marginalist concept of value and the law of diminishing utility, distinguished between use value and exchange value, differentiated between natural and unnatural forms of exchange, identified various types of justice, identified the problem of commensurability, stated that the natural acquisition of property enables men to live a good life in the polis, and explained that the use of money facilitates the equalization of want satisfaction. Greek philosophers generally disparaged some forms of acquisition activities and looked down upon money making. Aristotle was no exception and believed that there were limits to the legitimate role of commercial activity. He viewed estate or household management as natural and commerce and usury as unnatural and was disturbed by the prospect of the unlimited accumulation of wealth. Aristotle noted that in the pursuit of wealth as exchange value there are no limits to the end it seeks, whereas limits are set to wealth as use value. Aristotle recognized the function of money but for him interest appears to be contrary to nature and money making also seems to be rather unnatural. He says that wealth should be a means and not an end. Abstract economic theory made its greatest advances as a result of the doctrines developed at the University of Vienna by a group of economists known as the Austrian School. Carl Menger (1840-1921), the father of Austrian economics, taught that knowledge begins with induction and that economic subjectivism is compatible with philosophical realism. The desire of Menger, whose approach was close to Aristotelian philosophy, was to uncover the real nature or essence of economic phenomena. As an immanent realist, Menger was interested in essences and laws as manifested in this world. His economics subscribes to economic realism in its conception of the existence and epistemic attainability of what Adam Smith had viewed as the “Invisible Hand.” Menger’s economic theory was a general and abstract theory which attempted to unify all true fragments of economic knowledge. Holding that causality underlies economic laws, Menger taught that theoretical science provides the tools for studying phenomena that exhibit regularities. He distinguished between exact types and laws that deal with strictly typical phenomena and empirical-realistic types and laws that deal with truth within a particular spatio-temporal domain. Menger’s exact approach involves deductive-universalistic theory and looks for regularities in the coexistence and succession of phenomena that admits no exceptions and that are strictly ordered. His theoretical economics is concerned with exact laws based on the assumptions of self-interest, full knowledge, and freedom. Menger’s exact theoretical approach involves both isolation and abstraction from disturbing factors. Menger taught that there are objective laws of nature and that goods have objective properties that make them capable of fulfilling men’s needs. He states that goods have no intrinsic or inherent value and that value is a judgment made by economizing individuals regarding the importance of particular goods for maintaining their lives and well-being. People have needs as living, conditional entities. The value of goods is contextual and emerges from their relationship to our needs. Subjective value (i.e., based on one’s personal estimation) can be viewed as individual, agent-relative, and objective. According to Menger, judgments are subjective but the truth or untruth of them can be determined objectively. The truth requires correspondence of facts with the judgment that is made. Menger thus contends that economic subjectivism is compatible with philosophical realism. Menger, like the much later Ayn Rand, argued that the ultimate standard of value is the life of the valuer and espoused a type of contextually relational objectivity in his value theory. He defined value as the importance of a good in satisfying one’s needs. Menger also distinguished between economic and non-economic goods, developed a theory of marginal value, and investigated the implications of time and uncertainty. Menger was also concerned about the way in which institutions arise and incorporated ontological and methodological individualism and spontaneous order in his genetico-compositive understanding of social phenomena. For example, he said that money is a product of human action and not of human design. Ludwig von Mises (1881-1973) was dissatisfied with Menger’s Aristotelian methodology and value theory and therefore laid out his own view of economics and its fundamentals. Insisting on the a priori character of economic science, Mises relied upon aprioristic reasoning as the foundation of his thinking and work. He wanted to gain knowledge through purely conceptual and deductive reasoning from first principles. Mises wanted to study what is necessary and universal about actual actions performed by real human beings. He saw human action as the ultimate given. Mises explains that a person’s introspective knowledge that he is conscious and that he acts is a fact of reality independent of external experience. He said that action is reason applied to purpose and wanted to understand purposeful human action in an open-ended world of uncertainty. Mises named the study of human action “praxeology.” He maintained that the categories of praxeology are universally valid because they reflect the structure of the human mind and the natural world. Mises said that the statements and propositions of economics are a priori, are not derived from experience, and do not proceed from inductive generalizations. He contended that economic theory rests on a body of truths independent of time and place. Included among these truths are the notions of causation, valuation, means and ends, scarcity, choice, opportunity cost, social cooperation, marginal utility, the time-preference theory of interest, the laws of exchange, and so on. Misesian economics is descriptive, value-free, and apolitical. Mises explains that value judgments are subjective and cannot be argued about. The value of goods is thus in the minds of acting people and the content of human action is determined by the personal judgments of each individual. According to Mises, economics is a value-free science of means, rather than of ends, that describes but does not prescribe. He says that whether people act to attain happiness or some other goal is irrelevant for praxeological economics. "My interest in the inextricable interrelationships among freedom, morality, human flourishing, and happiness was first animated around twenty years ago when, at about the same time, I was reading the works of Ayn Rand, Leonard Peikoff, Tibor R. Machan, Douglas B. Rasmussen, and Douglas J. Den Uyl. I was strongly attracted to the idea of human flourishing and happiness as the prime goal of human striving." Economics deals with chosen human aims and values. Mises says that human reason and freedom play roles in every action. Values are freely chosen and a person can decide to initiate a chain of causation because he has free will—actions are self-generated and goal-directed. Mises understands that the study of human action can be used to make a value-free case for freedom. Mises observes that voluntary social cooperation springs from human action because higher production and greater prosperity in society arise from the division of labor. Each person is more likely to attain his own goals in a free society. Misesian value-free economics thus shows that only free-market capitalism can create a social order of freedom, peace, and prosperity. Mises says that if people want to promote human life, happiness, cooperation, progress, and so on, then they require a free market. He defends a free society and private ownership on the grounds that that they are the most desirable from the perspective of human happiness, freedom, peace, and productivity. Ayn Rand (1905-1982) constructed an entire integrated and coherent philosophy to underpin her ethics and politics, which stress individual happiness and natural rights. In her normative argument for classical liberal ideas Rand places freedom as a precondition for virtue. She derives an objective ethics based on the nature of man as a goal-seeking entity with the end goal as life as man qua man. According to Rand, happiness relates to a person’s success as a unique, rational human being possessing free will. Rand’s rational epistemology holds that knowledge is based on the observation of reality and that it is possible to gain objective knowledge of both facts and values. She explains that a concept is a mental integration of factual or perceptual data and that properly formed concepts are objective and contextual. Her epistemology transcends both apriorism and empiricism. Although she refers to essences or concepts as epistemological rather than metaphysical, she actually means relational and contextual. Rand says that at the root of the concept of value is the conditional characteristic of life and that ethics is an objective metaphysical necessity. Morality is a means to the end of life and ethics deals with concepts which Rand sees as rational and objective. Viewing reason as man’s means of survival, she maintains that man’s primary moral choice, following his “pre-moral” choice to live, is to focus his consciousness. Rand saw the virtues as inextricably linked and as the means to obtaining the values which, along with the virtues, enable people to attain their happiness. Hierarchically, philosophy, including its metaphysical, epistemological, and ethical dimensions, precedes and determines politics, which, in turn, precedes and determines economics. Rand bases her metaphysics on the idea that reality is objective and absolute. Epistemologically, the Randian view is that man’s mind is competent to achieve objectively valid knowledge of that which exists. Rand’s moral theory of self-interest is derived from man’s nature as a rational being and end in himself, recognizes man’s right to think and act according to his freely chosen principles, and reflects a man’s potential to be the best person he can be in the context of his facticity. This leads to the notion of the complete separation of political power and economic power–the proper government should have no economic favors to convey. The role of government is thus to protect man’s natural rights through the use of force, but only in retaliation and only against those who initiate its use. Capitalism, the resulting economic system, is based on the recognition of individual rights, including property rights, in which all property is privately owned. For Rand, capitalism, the system of laissez-faire, is the only moral system. She says that, if a person chooses to live, then he must recognize the importance of a free market and a minimal state. Murray Rothbard (1926-1995) developed a type of neo-Aristotelian natural law and natural rights theory. He derives the content of natural law and speaks in terms of natural law and natural rights. Rothbard combined natural law theory using an Aristotelian or Randian approach with the praxeological economics of Austrians such as Mises. He differs from the neo-Kantian Mises in his epistemology and instead returns to the Aristotelian epistemology of Menger to find the action axiom as based in empirical reality. Rothbard believed Mises to be on shaky grounds with his extreme aprioristic approach to epistemology. However, he did embrace nearly all of Misesian economics. Rothbard saw rights as essential to a libertarian social order. He thus advocated his nonaggression principle and the right to self-defense. Working largely within the Lockean logic of self-ownership, homesteading, and exchange, Rothbard became an ideologically committed zero-state economist who saw no role for government to play. For him political exchange equals coercion and market exchange equals voluntary agreement. Viewing the state as a vehicle of institutionalized crime, he supported free competition in the provision of defense and judicial services. Rothbard’s market-anarchist program is the instantiation of his libertarian moral theory which does not constitute a prescription for personal morality—it merely constructs a social ethics of libertarianism as a political philosophy. Basically, he holds that individuals can select their own personal values but should not endeavor to enforce their ideas of morality upon other people. He sees the nonaggression principle as consistent with diverse moral stances. There have been a number of attempts by contemporary thinkers to integrate and extend some combination of the insights of Aristotle, the Austrian praxeological economists, Ayn Rand, and modern political, economic, and other writers. An important argument that is frequently made is that ancient Aristotelian virtue ethics complements, and is compatible with, modern natural-rights-based classical liberal political theory. Having read the works of many of these contemporary scholars, as well as the writings of the exemplars mentioned above, my goal is to combine and synthesize a variety of insights to present a broad brush outline of a potential philosophical foundation and edifice for a free society based on the natural law, natural rights, liberal tradition. I want to demonstrate that neo-Aristotelian ethics and classical liberalism are compatible. This book concludes a trilogy of books that began with my Capitalism and Commerce: Conceptual Foundations of Free Enterprise (2002). The purpose of this first book is to be a clear, concise, and accessible guide to the concepts and moral values that provide the foundation upon which a free society is constructed. The concepts and values discussed in the book include: natural law, natural rights, individualism, personal responsibility, the pursuit of one’s flourishing and happiness, negative freedom, morality, freedom of association, civil society, the nature of true communities, the free market, private ownership, work, contract, the nature and responsibilities of the corporation, voluntary unions, progress, entrepreneurship, technology, justice, law, power, authority, constitutionalism, pluralism, and more. The second work in the trilogy is my 2008 book, Champions of a Free Society: Ideas of Capitalism’s Philosophers and Economists. It is built around the ideas of twenty great thinkers of the past and present who have been influential in developing the political and economic thought of the Western world. Its main purpose is to survey and overview the ideas of leading philosophers and economists of freedom. This book is designed to make clear the principal theoretical ideas of a wide range of outstanding thinkers who have contributed to the development of the classical liberal or libertarian worldview. The current book in this trilogy of freedom and flourishing has the goal of illustrating the potential of integrating essential features found in Aristotle’s works, Austrian Economics, Objectivism, and the writings of contemporary neo-Aristotelians into a broad natural law and natural-rights-based analytic and normative science of individual liberty. The ultimate aim is to interrelate and combine elements from these schools of thought into a coherent and cohesive worldview. In other words, the goal is to develop a more integrative and holistic view that emphasizes both complementarity and context. In these pages, I do not offer a full-blown, detailed system but rather a foundation upon which to build such a system. Some of the key ideas underpinning this systematic view are: natural law, a knowable human nature, realism, natural rights, individuality, man’s natural telos of flourishing and happiness, virtue ethics, agent causality, reason and rationality, free will and free choice, negative freedom, a minimal state, praxeology, the social nature of the human person, civil society, and subsidiarity. After an introductory chapter, Flourishing and Happiness in a Free Society is followed by three substantive chapters and a concluding chapter that summarizes the preceding chapters and that discusses the prospects and strategies for moving from the current world toward a world of liberty. The titles of the three main chapters are: (1) “Menger, Mises, Rand, and Beyond”; (2) “Human Nature, Flourishing, and Happiness”; and (3) “Toward the Development of a Paradigm of Human Flourishing in a Free Society.” Both chapters one and three are slightly modified versions of articles that have been published previously in the Journal of Ayn Rand Studies. A version of chapter two, “Human Nature, Flourishing, and Happiness”, has appeared in Libertarian Papers. I would therefore like to thank the publishers for permitting me to include them in this book. In addition, some material contained in the Introduction and Conclusion have been adapted from books previously published with Lexington Books, a sister company of University Press of America, the publisher of this current volume. I would like to thank Lexington Books for permission to use segments of my work previously published there. This book, together with the others in the trilogy it concludes, offers a systematic understanding that relies considerably on logic and common sense. More work will need to be done and more attention will need to be paid to details of the proposed research program. There are always more issues that need to be understood and explained in our efforts to determine the truth. The systematic approach I recommend is open to expansion, refinement, and revision and will need to be examined by scholars in a process of systematic interaction, debate, and rebuttal of various and opposing viewpoints. I would like to thank the countless writers of the past and present who I have read who have devoted their efforts toward the determination of the best social order based on their investigations and understandings of human nature and the world. In particular, I am indebted to the proponents of, and scholars who have studied, Aristotelianism, Austrian Economics, Objectivism, and Neo-Aristotelianism. Whatever I have written in this book has been gleaned from the writings of these thinkers. I wish to also thank several people for their help in my efforts to clarify the ideas that appear in this book. I am extremely grateful to the following individuals for their useful comments, observations, and suggestions: Roger E. Bissell, Peter Boettke, Samuel Bostaph, Frank Bubb, Robert L. Campbell, Douglas J. Den Uyl, John B. Egger, Stephen Hicks, Edward L. Hudgins, Jonathan Jacobs, Richard C. B. Johnsson, Stephan Kinsella, Shawn E. Klein, William E. Kline, Roderick T. Long, Loren Lomasky, Tibor R. Machan, Fred D. Miller, Geoffrey Allan Plauché, Douglas B. Rasmussen, Llewellyn Rockwell, Chris Matthew Sciabarra, Larry J. Sechrest, Aeon Skoble, Robert White, and Gary Wolfram. Of course, inclusion in the above list does not indicate endorsement of this book or agreement with the ideas expressed within it. It does mean that each person on the list assisted me in some way with this current project. In addition, I am most appreciative of my administrative assistant at Wheeling Jesuit University, Carla Cash, for her capable and conscientious assistance in bringing this book to print. Finally, in the end, it is only I who can be found responsible for any errors in this book.